The Pulitzer Prize-winning play Disgraced, by Ayad Akhtar, opens next Thursday, October 23, at the Lyceum Theatre, with a limited number of rush tickets sold on the day of each performance. The cast includes AMDA alumna Gretchen Mol, Hari Dhillon, Joshua Radnor, Karen Pittman and Danny Ashok. 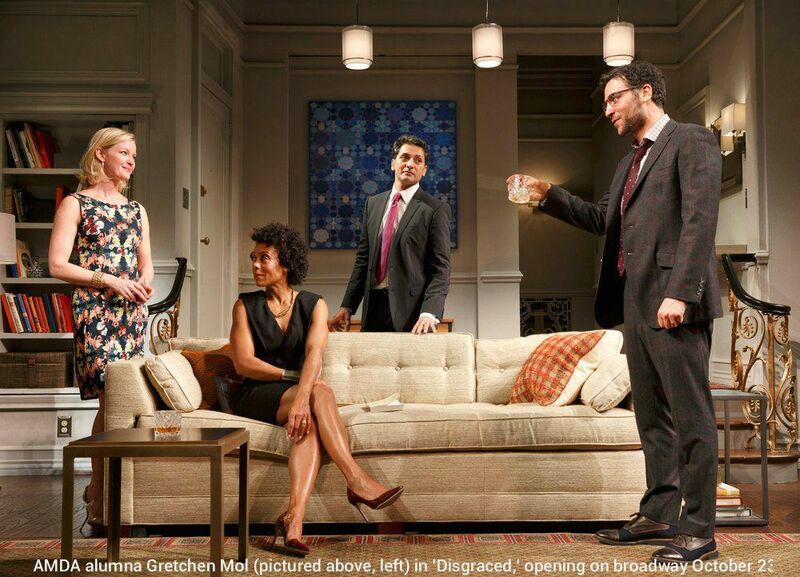 Disgraced, which won the 2013 Pulitzer Prize for Drama and an Obie Award for Playwriting, is about “an affluent Muslim-American couple living in New York City, whose views on race, relationships and identity are left shattered after a dinner party with a co-worker and her husband.” Find out more. Mol—a graduate of the Integrated Program at AMDA NY—has had a wonderfully diverse career, spanning from theatre to more than 30 feature films. She plays the recurring role of Gillian Darmody in HBO’s “Boardwalk Empire.” On stage, she played Jenny in Neil LaBute’s The Shape of Things (London and New York) and spent a year playing Roxie in the Broadway production of Chicago. In 1996, Mol made her film debut in Spike Lee’s Girl 6. Her most notable films include Rounders (with Matt Damon), Celebrity (opposite Leonardo DeCaprio), 3:10 to Yuma (starring Russell Crowe), The Thirteenth Floor, Puccini for Beginners, Sweet and Lowdown, and The Notorious Bettie Page (as the title character). Interested in seeing Disgraced? Rush tickets will be available for $32 at the Lyceum Theatre box office to same-day performances; however, for these tickets, remember to bring along the people going with you: only one ticket will be sold per person. Otherwise, full-priced tickets are available at Telecharge.com and at the box office. While dining recently at Gemma at the Bowery Hotel, Gretchen Mol and Joshua Radnor discussed their roles in Disgraced with Gotham Magazine. Catch up on their conversation.